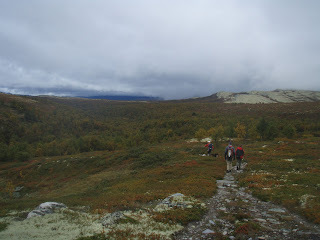 In early September, we drove 2 hours northwest of Lillehammer to Rondane National Park to spend the weekend in a rented hytte (cabin) with some Trondheim based American friends that we first met about 5 years ago. 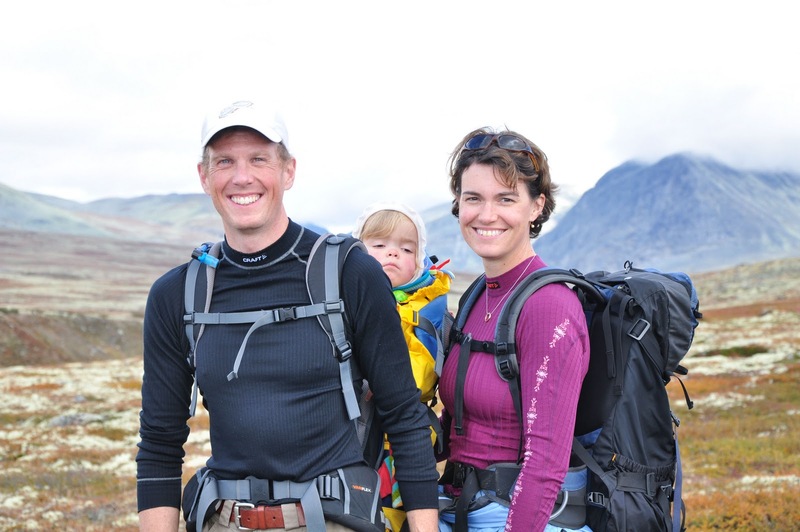 The Strimbeck/Bazilchuk family is originally from Vermont, but moved to Trondheim nearly 8 years ago when Rick took a job teaching biology at the University where Erik was once a student 15 years ago! We stayed with them in Trondheim for a few days during our first visit to Norway in 2006, having only corresponded with them via phone and email. 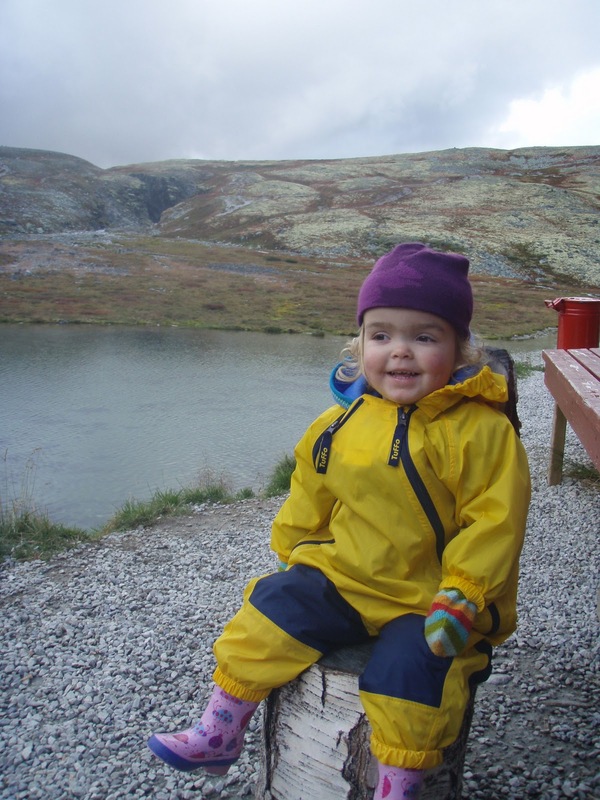 We enjoyed their company, and that of their two adorable little girls, and they inspired us to “keep the dream alive” of moving to Norway. In the months leading up to our move, we contacted them frequently for advice on our upcoming move. See Grandma? She is warm and happy. 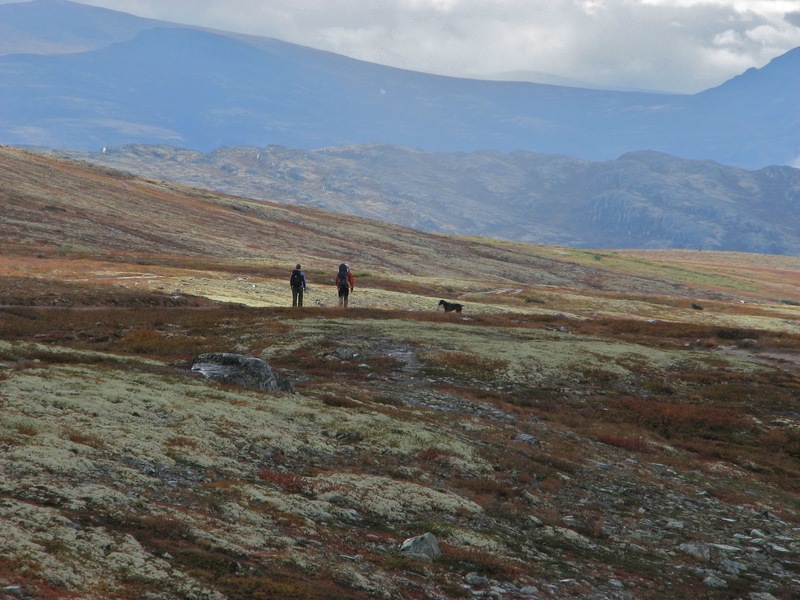 Our weekend in Rondane National Park was a way to meet up again with their family (minus their eldest daughter, now off to college! ), and reunite them with their beloved bentwood rocker, that we moved with us from Vermont. Nancy and Rick also accurately guessed that we might appreciate a little English conversation, as well. The hytte was a delight. And a few words about Norwegian hyttes, if I may pluralize them that way. 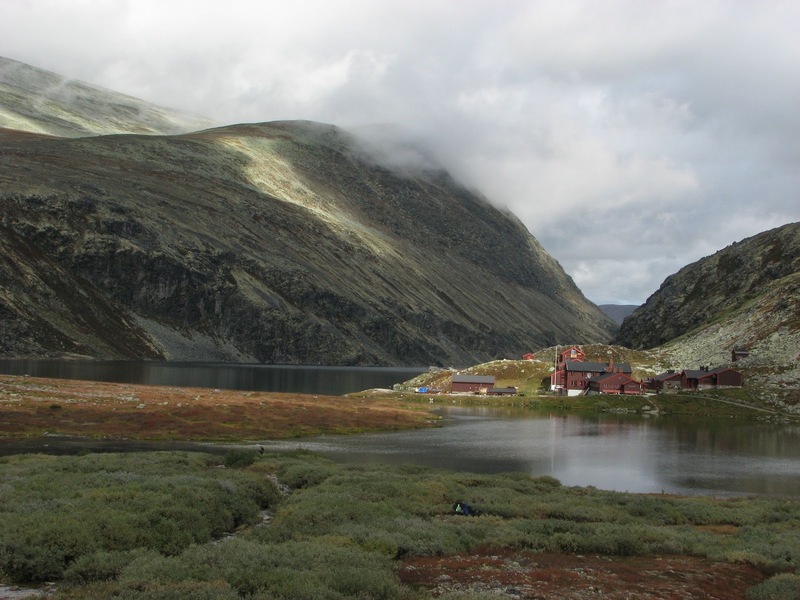 Many Norwegian families own a small cabin somewhere in the country. It may be a mountain cabin, or a coastal cabin, and are varying degrees of “rustic-ness”. Some have outhouses, other have flushing toilets, warm water, showers, even saunas. Some are very isolated, and others are in little cabin communities. 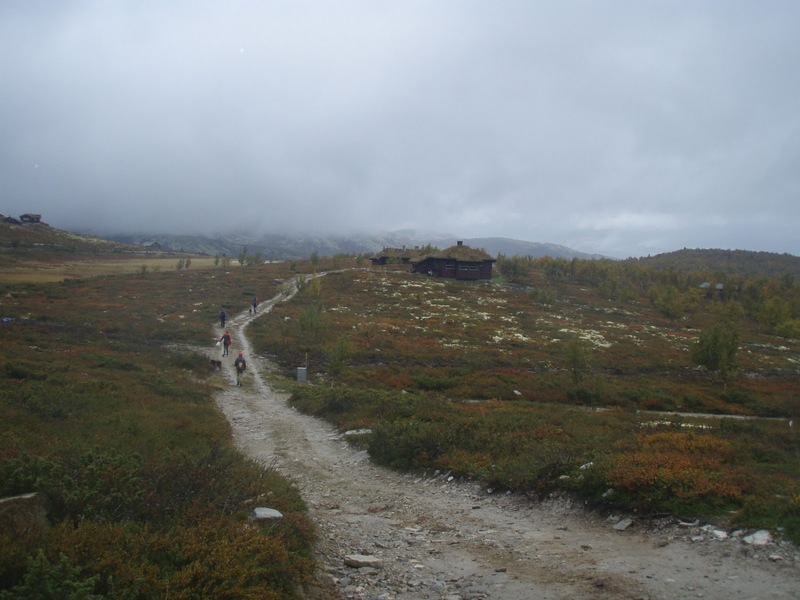 Many of these privately owned cabins are available to rent, but there are also DNT huts (the national hiking organization) scattered all across Norway available for members and non-members to use. Some of these huts are small and require that you pack in your own food. Others are full staffed and equipped—essentially a wilderness hotel, where all you need is your own sleep sack—the down comforters are provided. So, anyway, our rented hytte was a delight. The Strimbeck/Bazilchuk family had stayed there before on several occasions, including a Christmas week. 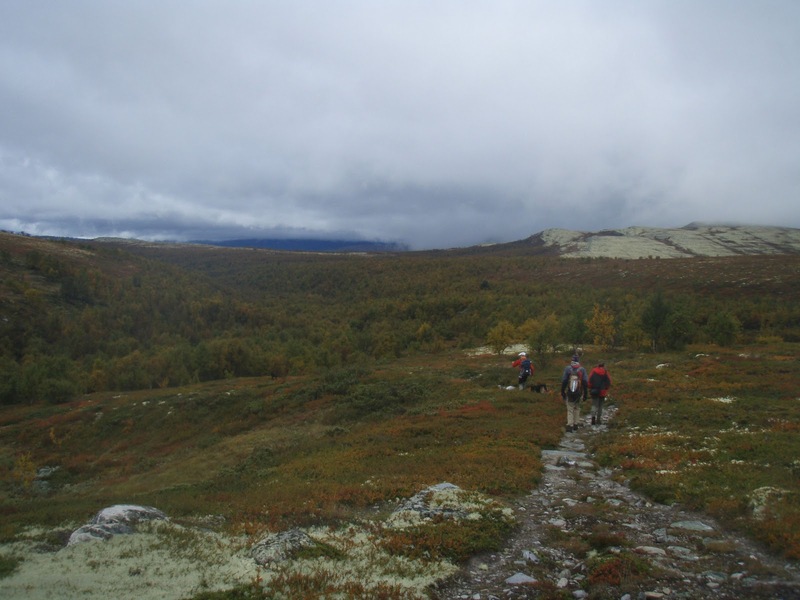 To get there, we drove north out of Lillehammer on E-6 to Otta, and then headed up some very steep roads and eventually above tree line, to a rather expansive hytte community. It was misty and overcast, which was unfortunate, as we could tell the fall colors were at their peak (which, remember we’re above tree line, so the colors are limited to mostly heather and lichen). We arrived Friday evening, prepared a warm dinner, let the two dogs get acquainted, settled Greta down into her crib, and enjoyed the warm fireplace, a bottle of wine, and “settling into Norway” conversation. In English! 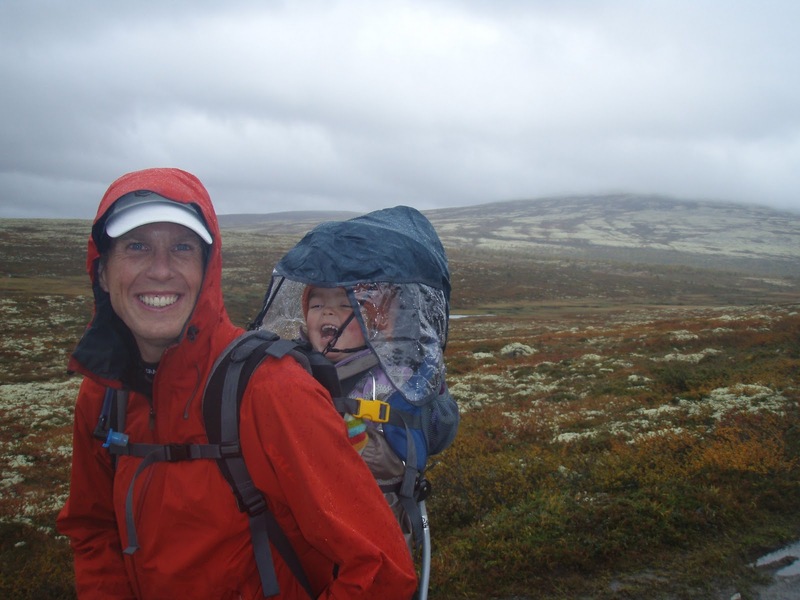 Saturday we braved the misty weather, and headed out for a hike into a nearby valley. The rain held until the last few minutes of our hike, and Greta was happy as a clam in her backpack through the entire 3-hour hike. Sunday’s weather looked more promising, and we opted for a hike along a gravel road that would take us to a large DNT hut where we could eat our lunch and get a cup of coffee. 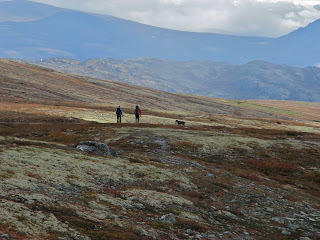 Again, the rain held off, and the dogs were allowed to run off-leash (a big treat in Norway). Greta enjoyed the hike (and the destination) so much that she didn’t want to go inside once we arrived! All in all, it was a very fun and relaxing weekend. It was great to see Nancy and Rick again, and be able to share our Norwegian moving stories with people who definitely knew what we were going through. doesn't want to go inside yet!